The NSWorkspace class provides a set of methods and properties which allow open and manipulate files, applications and others useful tasks. One of these properties can be used to list the running applications. The property is runningApplications , this will return an array of NSRunningApplication elements representing the running applications. Unfortunately the definition of this interface (NSRunningApplication) in the Macapi.AppKit is incomplete. As you can see in the above definition there is not a property to retrieve the application name or path. 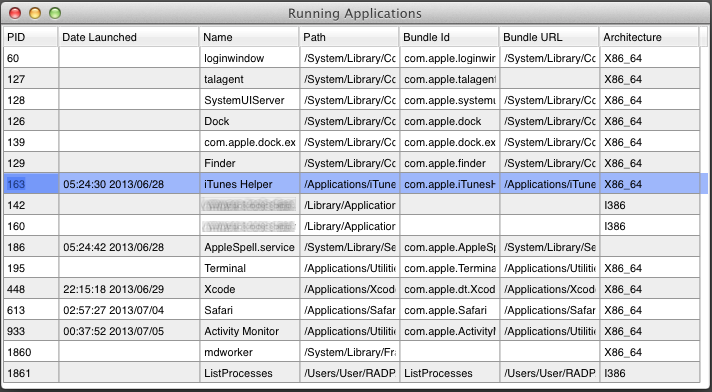 So the first task in order to retrieve the list of the running applications is add the missing properties like so. //Indicates the URL to the application's executable. //Indicates the name of the application. This is dependent on the current localization of the referenced app, and is suitable for presentation to the user. //Indicates the URL to the application's bundle, or nil if the application does not have a bundle. //Indicates the CFBundleIdentifier of the application, or nil if the application does not have an Info.plist. //Returns the icon of the application. Note : The runningApplications property only list the user applications and does not provide information about every process on the system. In order to access to all the process you can use the sysctl function with the CTL_KERN, KERN_PROC, KERN_PROC_ALL values. Download the sample Firemonkey project from Github. Categories: Delphi, Delphi XE2, Delphi XE3, Delphi XE4, OSX | Permalink. This is the continuation of the Getting System information in OSX and iOS using Delphi (XE2, XE3, XE4) Part 1 article. Inside of the Posix.SysSysctl unit (which is the translation for the sysctl.h file) you can find a set of arrays (CTL_NAMES, CTL_KERN_NAMES, CTL_HW_NAMES, CTL_USER_NAMES, CTL_VM_NAMES) which contains the alias names for the system information elements, so using the items of these arrays you can build the name parameter for the SysCtlByName method. Another option is use these definitions for build a set of methods to retrieve all the system info included in these structs. Try the next sample project. Categories: Delphi, Delphi XE2, Delphi XE3, Delphi XE4, OSX | Tags: Delphi, OSX | Permalink. In the following article you can learn how to use the sysctl, sysctlbyname and sysctlnametomib functions to get system information (kernel values, hardware, networking, file system, machine specific and user related data) under the OSX and iOS systems. Note : The Posix.SysSysctl unit is a partial translation the sysctl.h file. name : This parameter receive a pointer to a Management Information Base (MIB) style value, which is only a array of integers. Each element of this array must be filled with the values related to the info to read or write. The number of elements of this array, depends of the data to be obtained or modified, most of times only we need to pass and fill a mib with 2 elements (integer values). The first element indicates the level(location) of the info and the second element indicates the value to retrieve. These are the possible values for the first element of the mib. Note: All these values are already defined in the Posix.SysSysctl unit. The second element value is related to the first level and the possible values are defined in the Posix.SysSysctl unit as well, for example to get the max processes supported by the system we must use the KERN_MAXPROC($00000006) value. namelen : This parameter is the length of the mib structure. oldp: Must be filled with a pointer to the buffer to receive. The info which can be a integer, int64, a AnsiString(MarshaledAString) or a record. oldlen: Indicates the size of the oldp parameter. newp: This parameter must be filled with a pointer to the buffer to with the info to set up, when you don’t modify the data you must pass a nil value. newlen: Indicates the size of the newp parameter. So with all the above info now you can write a function to retrieve the max processes supported, check this sample code which retrieves a integer value. To get a Int64 value the code is very similar, check this sample which get the size of the memory installed on the system using the CTL_HW level and the HW_MEMSIZE value. If you want retrieve a string value, you must get the length of the value before to allocate the buffer, to do this you must pass a nil value in the oldp parameter like so. The next code shows how to get a string(ascii) type using the sysctl function. Finally we can use the sysctl function to retrieve complex structures(records) passing a pointer to the record to hold the data. Try this sample which get the clock rate values from the kernel. The sysctlbyname works in the same way which the sysctl, the only difference is which the values are accessed using a alias string. because that you don’t need pass a mib structure and length to this function. name: this parameter is the alias for the info to access and is composed by the level splus the string representation of the value to get, because that you don’t need pass a mib structure. This is a sample list of some of the values which you can use in the name parameter of the sysctlbyname function. Note : You can get a full list of the supported values running the sysctl -A command from a Terminal. Finally this code shows how use the SysCtlByName function to retrieve the number of cpus installed. Note : The sysctl function runs in about a third the time as the same request made via the sysctlbyname, so when is possible uses sysctl instead. The sysctlnametomib function fill a mib structure using a alias a string. this function is intended for use by apps that want to repeatedly use the same variable. name: ASCII representation of the value to retrieve. mibp: pointer to the mib structure to fill. sizep: pointer to the length of the mib structure to fill. //now the mib structure is filled with the proper values to call the sysctl function. All the above functions returns a 0 values when the execution was succefull, otherwise an error code is returned, this code can be obtained using the errno (Posix.Errno) or the GetLastError function. [EFAULT]           The buffer name, oldp, newp, or length pointer oldlenp contains an invalid address. [EINVAL]           The name array is less than two or greater than CTL_MAXNAME. [ENOMEM]           The length pointed to by oldlenp is too short to hold the requested value. returned data exceeds the system limit on locked memory. [ENOTDIR]          The name array specifies an intermediate rather than terminal name. [EISDIR]           The name array specifies a terminal name, but the actual name is not terminal. [ENOENT]           The name array specifies a value that is unknown. [EPERM]            An attempt is made to set a read-only value. [EPERM]            A process without appropriate privilege attempts to set a value. This a full sample console app which summarizes this article. Categories: Delphi, Delphi XE2, Delphi XE3, Delphi XE4, iOS, OSX | Tags: Delphi, iOS, OSX, sysctl | Permalink.